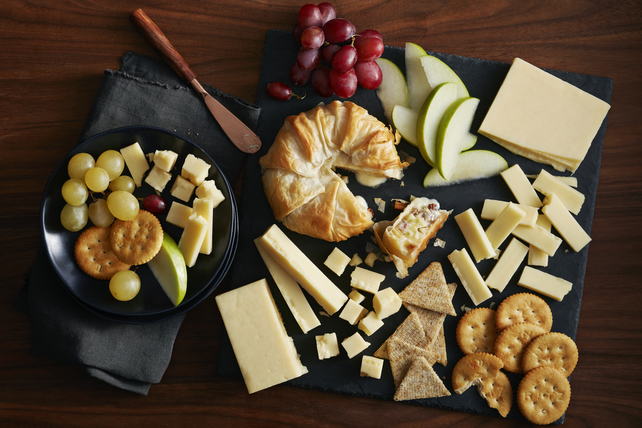 This elegant platter of stuffed Brie, cut cheese and assorted crackers is sure to be the centre of attention at any party! Chop half the apple finely; place in small bowl. Add nuts and syrup; mix lightly. Stack phyllo sheets, brushing lightly with butter between each layer. Reserve remaining apple and butter for later use. Cut phyllo stack into 10-inch round; discard trimmings. (Or, see tip for how to use to the trimmings.) Place bottom half of Brie on centre of phyllo round; top with half the apple mixture. Cover with top of Brie and remaining apple mixture. Wrap phyllo around Brie, folding phyllo as needed to completely enclose Brie. Place on baking sheet or in pie plate; brush with remaining butter. Bake 15 min. or until golden brown. Transfer to platter. Cut remaining apple into thin slices. Add to platter along with the remaining ingredients to serve with the Brie. For best results, thaw phyllo overnight in refrigerator before using as directed. Cut phyllo trimmings into strips; sprinkle with cinnamon sugar. Twist strips; place on baking sheet. Bake along with the Brie for the last 5 min. of the Brie baking time. Sprinkle with icing sugar. Add to platter along with the remaining ingredients. Use kitchen shears to cut out the stacked phyllo round. To help prevent the remaining apple half from turning brown before using as directed, dip the cut side of the apple into lemon juice, then wrap tightly with plastic wrap and refrigerate until ready to use as directed. Serve with seedless red and green grapes.